Group photo of the field school students and the author. Many of the students are from Oahu’s leeward communities. Photo by Dr. William Belcher. As a ParkEDU education specialist at World War II Valor in the Pacific National Monument, funded by Pacific Historic Parks (PHP), I was given a rare opportunity to participate in the University of Hawaii – West Oahu’s (UHWO) archaeological field school held at Honouliuli National Monument. In June, students from UHWO, led by Dr. William Belcher, headed into the former site of Hawaii’s largest and longest-operating internment and POW camp during World War II. 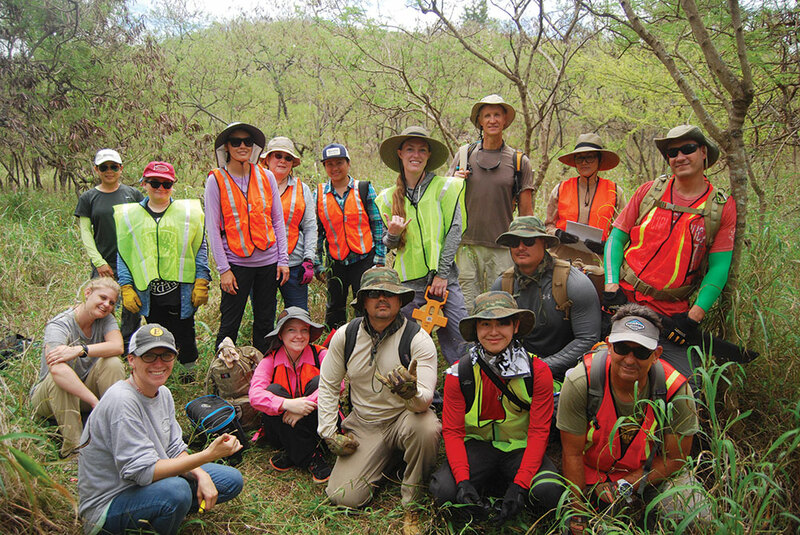 The 16 students are undergraduates either working on their bachelor’s degree with a concentration in archaeology or UHWO’s Certificate in Applied Forensic Anthropology. Example of an artifact found at Honouliuli. Once the artifact was given a GPS location and pictures were taken of the artifact in its found location, the students were allowed to examine the artifact more closely. 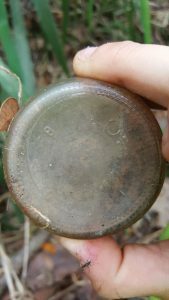 Based on the writing on the bottom of this glass bottle, and a little research, Dr. Belcher’s students were able to tell what the contents were — alcohol. Photo by Jo Yeomans. The primary focus for the class was to examine the POW areas as well as the pre- and post-camp land use of the area. Specific topics covered in the class included lectures on cultural resource management, photography, field mapping, field GIS (with ArcPad), total station use and excavation strategies. The students learned hands-on skills that they will use in their future careers. The students were divided into four teams, and the teams rotated between Compound I and VII. Towards the end of the second week, three other students and I were tasked with walking to the west end perimeter. It was there that I discovered an aqueduct running the entire slope of the farthest northwestern hill. We brought Dr. Belcher to where I had found the first pieces, and he was ecstatic at the find. He noted the GPS coordinates, and the students worked on excavating the aqueduct over the rest of the course. Students work on clearing the aqueduct and wall, both of which predate the internment and POW camp. Students used hand tools to remove trees, shrubs and debris from the area. Photo by Dr. William Belcher. 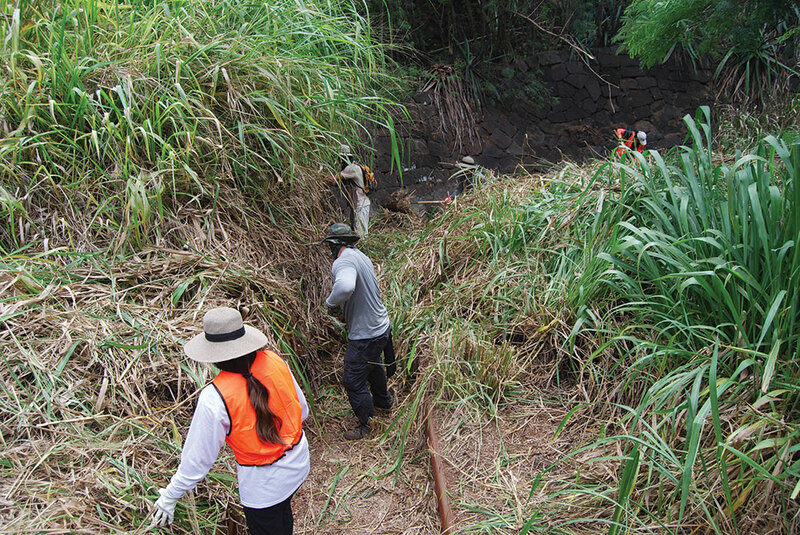 The UHWO 2016 field school was one of many examples of archaeological investigations carried out at Honouliuli by UHWO and the Japanese Cultural Center of Hawaii (JCCH) since the rediscovery of the site by the JCCH in 2002. In September 2016, a collaborative partnership was established between the National Park Service (NPS) and UHWO that will engage students in collecting, coalescing and incorporating all existing data from past investigations into a database, in addition to continuing with additional survey work through a 2017 field school. This database will help the NPS create a resource protection program as planning for Honouliuli is further along.